Toby Murray has integrated OSM Notes in JOSM. There are details in his blogpost. DougPeterson describes his workflow for generating GPS Tracks on a separate map with a GPS logger, Locus Map Pro, Osmosis and Mapsforge. The voting for the proposed feature “Traffic Signals” is ongoing. Sander17 shows statistics concerning the number and mapping type of address in Belgium in his user diary. In Brussels, the addresses were imported automatically, while in Flanders a manual address import is currently running , as the data source does not meet the OSM-quality standards. Two new OpenGeo interviews: Stefan Keller amongst others talks about Tagfinder, and Edvin Brobeck discusses Mapiful. Rafael Avila Coya, an experienced mapper and importer wants to import forest roads of the World Resources Institute in the Congo Basin (Cameroon, Equatorial Guinea, Central African Republic, Gabon, Congo and Republic of Congo). He announces what he has imported so far, but only at the HOT mailing list. It looks like OMV, an Austrian chain of gas stations, imported their data twice (G-Translate) without prior discussion ,and still technically “not at an optimal” level (G-Translate). 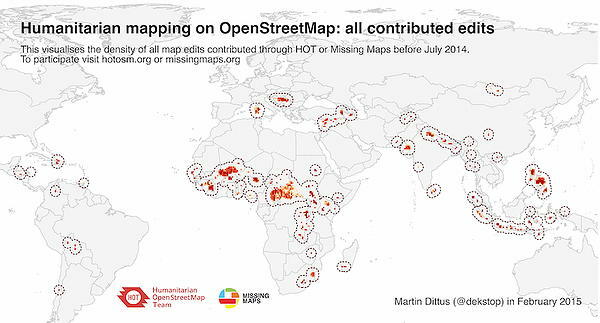 Martin Dittus created an impressive map of all HOT contributions. The OSM user zool reported from the recent “Missing Maps” Mapathon in Edinburgh. HOT is looking for an experienced mapping supervisor to coordinate the future HOT activities in Dar es Salaam, Tanzania. English and Swahili are both required! The online magazine Mashable writes about digital Jedis and confused slightly Patrick Meier’s‘ activities with those of HOT. With Task 866 of HOT Task Manager it is now possible to map in the city of Erbil in Iraq in order to support the coordination of refugee flows. … and yet another openstreetmap-carto style update v2.28.0. Esri offers an OpenData solution as well – very commendable. We find, however, that open source solutions are more suitable for open data, for example ckan. The French tax administration (DGFIP) has released their WMS service for viewing the cadastre. Cadastre can be used more easily, but only in areas where the cadastre is available as vector images. Daniel Kirstenpfad has published a location tracking solution named Miataru in open-source format. Overpass turbo, the graphical interface for the Overpass API has become two years old, recently. tyr_asd shows some graphics illustrating the spatial distribution of queries, the language used and the total views. The new Android app QField is now QGis compatible. The software is open source and free to use. To support further development, you can buy the “QField for QGIS Karma edition app”. Tom MacWright has published his presentation of Turfjs. L.Line3 is a plugin for the Leaflet that produces three-dimensional lines (one could also say walls). The American Red Cross has released OpenMapKit a toolset to exchange data with the OSM API with an Android app, server, and other tools. In his user diary, Joost Schouppe reflects on permanent user IDs and linking external data with OSM objects. Telenav is looking for a “Senior Software Engineer – OSM”. There are more jobs at the Telenav site. Hehe, the translation is just a few hours too slow.